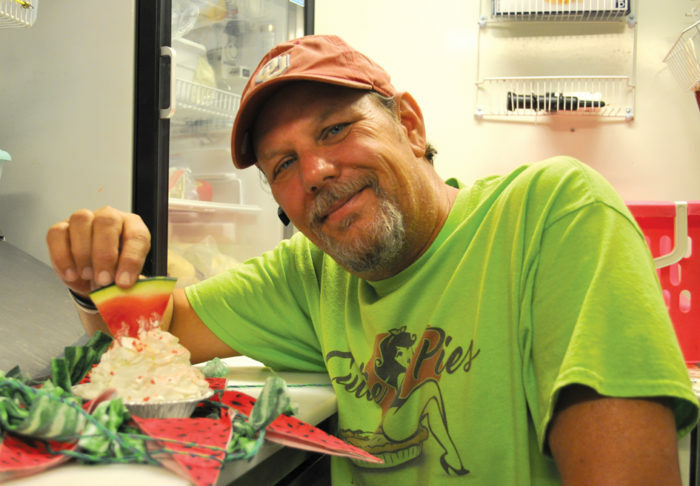 Mike and Belinda Winslow, owners of Cutie Pies Concessions, took first place for their watermelon pie at the State Fair of Oklahoma. This fall has been pretty sweet for Belinda Winslow and husband Mike. In September, she received the blessed news that her 27-year-old daughter was finally cancer free. October saw her Watermelon Pie creation clean up in the awards category at the Oklahoma State Fair. The pie, an old recipe from her childhood, earned the FAIRest of Them All award as the best overall food creation. The fruity, creamy treat also was named the top overall sweet offering at the fair, dubbed Sweetest of the Sweet. “We’ve had a good year this year,” Belinda Winslow smiled. Going up against eclectic creations like deep fried coffee, Frosted Flakes chicken on a stick and Kit-Kat fries, Winslow’s watermelon pie blew away judges at the Great TASTE of a Fair competition which immediately precedes the September fair. The event, staged to whet appetites and drum up publicity for the fair, was Winslow’s coming out party for her mobile food truck business. Based out of Moore, the Winslows opened their trailer for business in March 2015 after scores of friends and family kept insisting they bring the watermelon pie to every gathering. Winslow said some of those invites may have just been for the pie, but it was clear she had something on her hands that people really liked. So did the idea of opening her own business. Her and her husband, who runs a full-time paint contracting business, began drawing up a business plan months earlier. Cost projections outpaced savings for opening a traditional brick-and-mortar business. “The food truck was the first thing we could think of,” Winslow admitted. A business on four wheels came with its drawbacks. Running a business in a trailer meant more prep work. Winslow typically makes her runs to Sam’s Club, Wal-Mart and the Chef Store the Tuesday before an event. Six to seven hours the following day are spent doing prep work, including cutting up some 20 to 25 watermelons by hand. The concept also came with advantages. Being on wheels means that Cutie Pies can be at almost any venue in the state with enough advance notice. This month the trailer will pull up to Norman and the University of Oklahoma Day of the Dead Celebration. The following day Cutie Pies will be at Integris Baptist with 100 pies for a private event hosted by the radiology department. 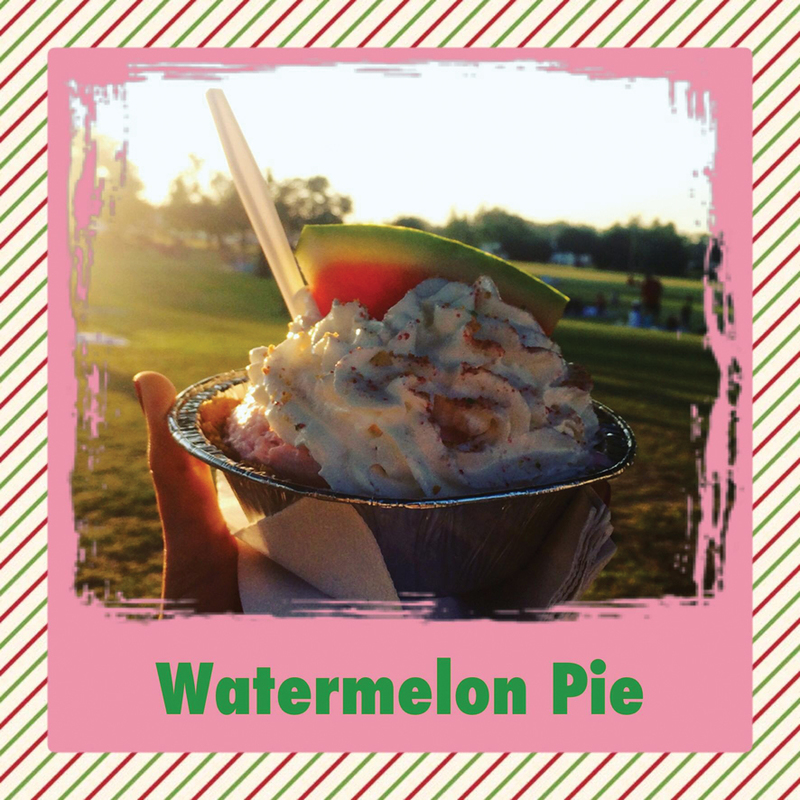 Twelves days later you can find watermelon pie at the Luther Pecan Festival. Outside of the State Fair, Winslow said one of the company’s best events is always the The Old Chicken Farm Vintage Barn Sale in Jones. It’s a good thing Cutie Pies gets around because it will take you awhile to work through the menu. Watermelon pie may be the star but there’s a talented ensemble cast of banana cream cheesecake, root beer float pie, cherry limeade pie and cotton candy pie. If sweet isn’t your thing they have savory covered, too, with Winslow’s chicken and corn frito pie. The twist on the original frito pie includes santa fe chicken layered on Fritos doused in queso cheddar cheese mixed with feta, cilantro and a special chili lime mayo. Wash it all down with a variety of lemonades – including watermelon, of course. “This our first year to actually make money,” Winslow said. And that’s despite a trying year. Winslow’s daughter battled stage IV ovarian cancer before doctors announced she was cancer-free three days after her last surgery. Through it all, Winslow has been her daughter’s caregiver, keeping her out of the truck for most events. That’s meant Mike pulling double duty. “He’s been our savior. He’s saved both of our businesses,” Winslow said of her partner of 20 years. But it all paid off this fall. All three of Winslow’s kids help in the business including a 21-year-old daughter and a 38-year-old son. Her two granddaughters pitch in, too. So what’s next? Can she top Watermelon pie? “I have somethings in the works for next year but I can’t tell you,” Winslow laughed. You can find out where Cutie Pies Concessions will be next through their Facebook page.